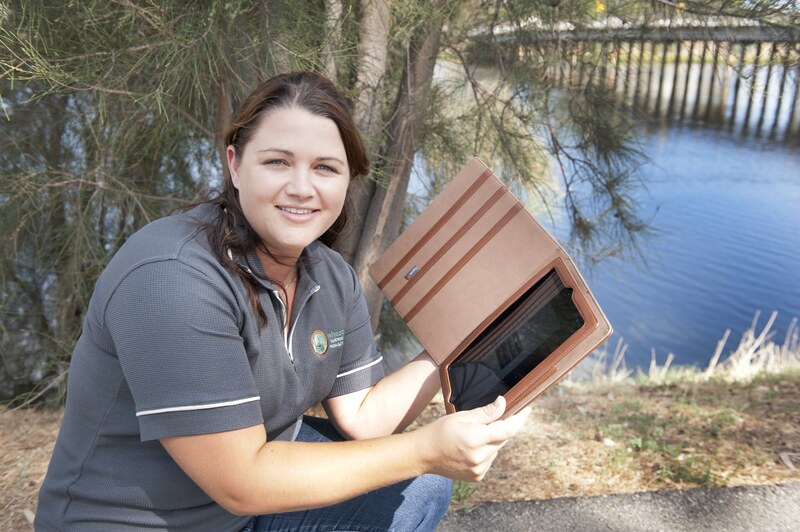 Some of the Wheatbelt’s environmental managers have now been armed with the latest computer technology to help them in the field. An $80,000 grant from Lotterywest has been awarded to natural resource management group Wheatbelt NRM. The money has been used to purchase computer tablets to be used outside the office, as well as a general upgrade to all computers in the Northam office. Georgie Chrimes is the project manager for sustainable agriculture and said the technology would make an enormous difference. “Sometimes we go into the paddock with so much gear for soil testing, drilling holes and water quality monitoring, that it makes sense to have a compact and easy way of recording data,” Georgie Chrimes said. “I use pen and paper because the risk of over-heating the laptop while it’s sitting in the ute is very real when I’m spending summer days working in the region. “The laptops are too big to use in the paddock, but now we have the tablets they can come with me everywhere. “Recording farmers ideas and hopes for their land is an important part of what we do, having the tablet means we can do it quickly and easily.” The grant will also focus on expanding the group’s film making capabilities. In the last year, Wheatbelt NRM made DVDs of rare wildlife and the rehabilitation of indigenous sites of cultural significance. The six board members of Wheatbelt NRM also have access to the computer tablets, so they can attend meetings without having to always travel. The public can also expect to see some of the new technology at work outside Wheatbelt NRM’s Northam office. A web kiosk that gives access to publications, resources and information on natural resource management is expected to be up and running in the next two months. This web kiosk will travel to schools, field days and shopping centres, helping to educate people about the Wheatbelt.